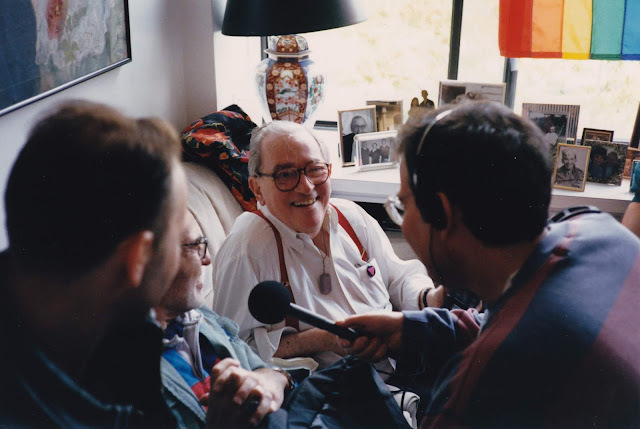 Liebman in his DC home in 1993 during interview with activist Larry Kramer. Marvin Liebman was born today, July 21,in 1923. He was an American conservative activist and fundraiser, and later in his life, a gay rights advocate. Liebman was raised in Brooklyn, New York. While in high school, he became interested in left wing politics and joined both the American Student Union and Young Communist League. At age 19, Liebman was drafted and served in Naples and Cairo during the final years of World War II. While in Cairo, his commanding officer discovered a series of letters written by Liebman that revealed his homosexuality. The officer subjected Liebman to repeated private and public humiliation before Liebman was finally given a blue discharge for homosexuality. After being sent home to New York City, Liebman met and quickly married a woman named "Patsy." Their relationship, though, was never consummated and the marriage was annulled after less than 6 months in June 1945. Over the next several years, Liebman became increasingly involved in Jewish/Israeli political issues, working in various volunteer and paid positions for the American League for a Free Palestine, United Jewish Appeal, Aguduth Israel and the American Fund for Israel Institutions. In 1947, he also worked with Irgun, a right-wing terrorist organization which was attempting to secure Israeli independence through a campaign of bombings aimed at the Arabs and British. During this time, Liebman began developing more conservative political views, including a passionate hatred for the Soviet Union stemming from the communist country's reportedly harsh treatment of Jewish citizens. In 1957, he founded Marvin Liebman Associates, Inc. For the next 11 years, Liebman's firm developed direct-mail fundraising programs and provided public relations expertise to the anti-communist and conservative movements in the U.S. and abroad. Its extensive list of clients included the Committee of One Million, Aid Refugee Chinese Intellectuals, the American Emergency Committee for Tibetan Refugees, the American-Asian Educational Exchange, the American African Affairs Association, and the American Committee for Aid to Katanga Freedom Fighters. In addition, Liebman was an early supporter and co-founder of Young Americans for Freedom and the American Conservative Union. In the early 1950s, he was a leader of the so-called "China Lobby," serving as secretary of the Committee of One Million Against the Admission of Red China to the United Nations. Founded in 1953, this organization survived until 1971 (the year that China was finally admitted to the UN), with Lee Edwards taking over as secretary from Liebman in 1969. A number of its former members joined Liebman in the American-Chilean Council. In 1958, Liebman also became general secretary of a steering committee announced in Mexico City to explore the possibility of combining the Asian People's Anti-Communist League with its own Latin American offshoot to form what eventually became the World Anti-Communist League. 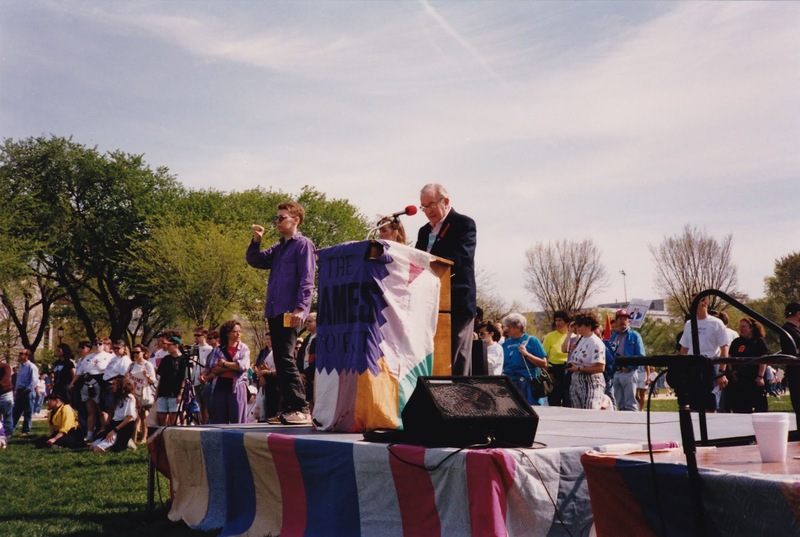 Marvin Liebman reading names at the AIDS Quilt podium on the day before the 1993 March on Washington for Lesbian, Gay, and Bi Equal Rights and Liberation. Toward the end of the 1960s, Liebman became exhausted with his New York-based political activities, moved to London, and began a short career in theater production. From 1969 to 1975, he was managing director of Sedgemoor Productions. During this period, he produced or co-produced nine West End productions, an equal number of touring or out-of-town productions, two television film, and three feature films. In 1975, Liebman returned to New York City to organize Marvin Liebman Inc, a firm with the same mission as his earlier Marvin Liebman Associates. Among the notable clients were the Friends of Free China, the Friends of Jim Buckley, the Committee of Single Taxpayers, the American-Chilean Council, the Ad Hoc Citizens Legal Defense Fund for the FBI, Firing Line and Covenant House. He enjoyed a long-time friendship with William F. Buckley, Jr. and his family. Liebman viewed Buckley as an inspiring mentor. Despite being born into the Jewish faith, under Buckley's guidance Liebman had converted to Roman Catholicism. At his baptism, Buckley served as Liebman's godfather and Buckley's sister Priscilla served as his godmother. With the Ronald Reagan presidential victory in 1980, Liebman went to Washington, DC. He was Consultant to the Office of Policy and Planning for Action from June through October 1981, Consultant to the Office of Public Affairs for the U.S. Department of Education from October 1981 to February 1982 and Director of the Office of Public Affairs and Director of Special Projects for the National Endowment of the Arts from February 1982 to July 1987. He later served as Director of Special Projects and Acting Director for the Office of Public Affairs at the National Endowment for the Arts. In July 1990, Liebman shed a lifetime of closeted living after writing a coming-out letter to Buckley, who was then editor-in-chief of the National Review. "I am almost 67 years old," he told Buckley. "For more than half my lifetime I have been engaged in, and indeed helped to organize and maintain, the conservative and anti-communist cause...the Conservative Party of New York...the Goldwater and Reagan campaigns...All the time I labored in the conservative vineyard I was gay." Liebman's personal letter to Buckley was followed up by an interview printed in The Advocate, where he expressed his disgust at the increasing influence of the Religious Right within the Republican Party as the Cold War came to an end. 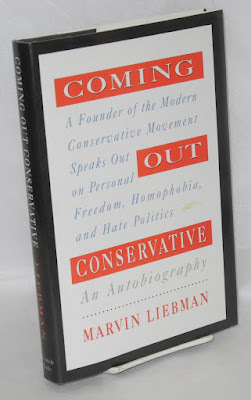 He believed that homophobia was becoming the new basis for organizing conservative groups in the U.S., now that anti-communist sentiments were becoming less relevant. His autobiography, Coming Out Conservative, was published in 1992. In the book, he said that within the Republican Party he had begun to "feel like a Jew in Germany in 1934 who had chosen to remain silent, hoping to be able to stay invisible as he watched the beginning of the Holocaust." Over the next 5 years he became an outspoken advocate of gay and lesbian rights in the U.S., writing numerous articles and traveling the country to speak at various meetings and rallies. Although he initially labeled himself a moderate Republican and worked to support gay-friendly conservative groups, including Log Cabin Republicans, he eventually concluded that he could no longer self-identify as a fund raiser for or supporter of any conservative group because of the increasingly anti-gay rhetoric of the political right. Liebman also later renounced his ties to Catholicism. In the final years of his life, he chose to describe himself as an "independent." He died of heart failure on March 31, 1997. Interesting post! Thanks for writing it.I always like and such a super contents of these post. Your post is very neat and very decent. I am always like your post and your explanation is very nice. It's very good info and thanks to you! Looks great and every freshers want to go through your blog for their growth. Amazing blog you have given and you made a great work.surely i would look into this insight and i hope it will help me to clear my points.please share more informations. Enable to gather a lot of information associated with this domain. Thank you.